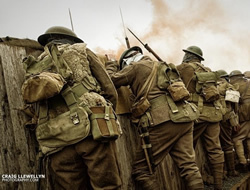 The Royal Warwickshire Regiment 1914-1918 Living History Group is dedicated to the memory of the soldier of the Great War of 1914-1918, specifically portraying the Royal Warwickshire soldier from 1914-1918. Training days take place and events are organised by the group. Bookings can be made for special events, film work and historical advice. 1 Photograph by Craig Llewellyn, courtesy of the Royal Warwickshire Regiment 1914-1918 Living History Group. 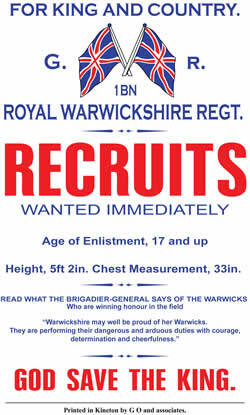 Recruiting poster image courtesy of the Royal Warwickshire Regiment 1914-1918 Living History Group.